The teaser photos were of my freezer full of big ice in preparation for shaking cocktails and the door to my building which seems to become more sketchy with graffiti every week. The door belies the spacious top floor, which is perfect for entertaining. Since I don't post as often as many of the previous blogers you probably don't know as much about me. I'm second generation Korean from originally from Los Angeles but I've been residing in New York for past 8 years now. I never considered myself a foodie or even into food while I lived in Los Angeles because almost all the food I ate growing up were traditional Korean meals. Between my parents they both managed to juggle their careers while raising 2 boys and cooking practically everything from scratch. 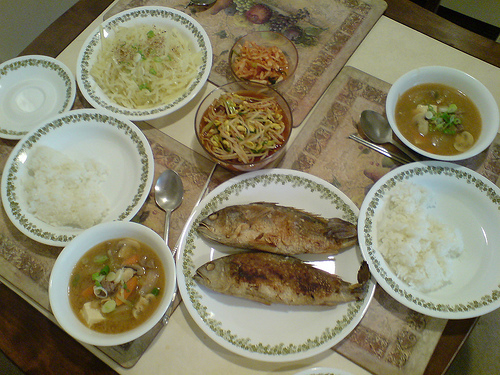 Even the simplest meal of left overs consisted of at least 3 ban-chan (sides), a soup and a protein. Moving to the east coast I was hit with the double blow of moving away from the fresh local produce of Southern California and the horror of institutional dorm food. For the first time I really began to think about not only the quality of what I was eating but also the economics behind it. How could my school charge between $9-$14 for each meal yet provide such sub-standard food when I can get Chinese delivered to my door for under $5? What can I salvage from the salad bar to bring back to the communal kitchen to cook? 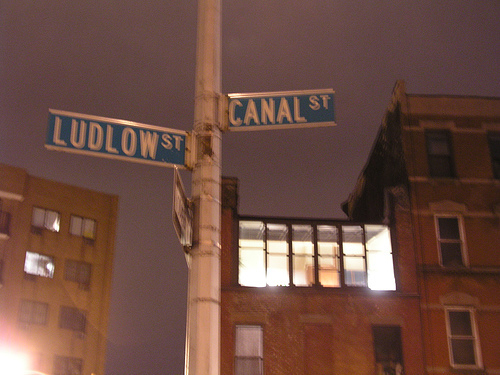 Now I live in the Lower East Side of Manhattan with two roommates. My day job is computer systems administration for a financial services company, which is sometimes too reminiscent of Office Space and Dilbert (hence don-bert). In my spare time I do a lot of cooking and eating out, but for the last year I have been most deeply into the "fine art of mixing drinks". I discovered cocktails through the bars Pegu Club and Milk and Honey. I was instantly hooked. I needed to know why I never had a drink that good before and how I could make them myself. After drinking too many Manhattan variations with eGullet lurker TheManInWhite we decided that to truly learn all the classics and experiment new recipes we needed to spread out the liver damage and invite some victims... I mean friends... over to try some real cocktails. What started out as 3 whiskeys, 2 vermouths, and 3 kinds of bitters has snowballed to over 200 bottles of alcohol and a bi-weekly underground cocktail party at my place. Tuesday: Repeal Day! Going to celebrate the repeal of prohibition in style at Pegu. Wednesday: A trip to NJ in search of the perfect ice cube tray. Friday: Cocktails at my place. Saturday: Bootlegging alcohol up to Boston to throw a cocktail party at a friend's place. I like your food pyramid. 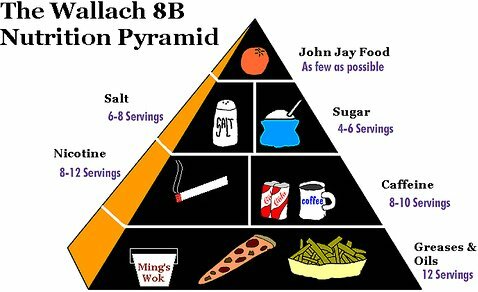 My food pyramid would look like this: 50% desserts, 30% fatty meats and stinky cheeses, 15% good bread and almond croissants, 5% coffee/alcohol. Looking forward to learning about cocktails. Which is your favourite? Mine is a French 75.
donbert, love that food pyramid - thanks for sharing. I'll look forward to getting to know you better, donbert. Feel free to PM me if my participation in any of the New York stuff you're doing this week would be useful. I'm a bit busy but do have some free time on some days. I'm really looking forward to reading about your week. When I saw the teaser photos I guessed we'd be in store for some great drinks! Party on Donbert. Party on. Same here, Don...and I was wondering where the "bert" part came from...should've known as Dilbert is our favorite comic! 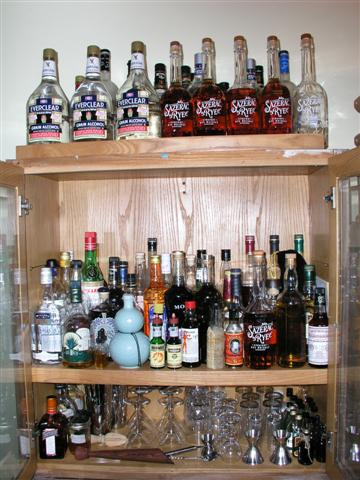 Now I know why I can't find any Sazerac Rye!! You have it all! Good stuff! Care to share your recipes for Manhattans or whatever else you are using the Rye in? Excellent to see a fellow Columbian blogging about NYC. I credit Columbia with my introduction into foodieness as well... the meal plan was so poor that I got off of it in my second semester of freshman year and started shopping at UFM (RIP), Mama Joy's (RIP) and the West Side Market (RIP)... I don't know what a similarly afflicted Columbian today would do without those fine markets around in the neighborhood. /Also lived on 8th fl of Wallach sophomore year. I'm the only un-young, un-hip member to check in so far, but I'm looking forward to this busy, bustly week. Breath of fresh NY air to our soft-moving days, and we're anticipating some shaker-stirrer action. 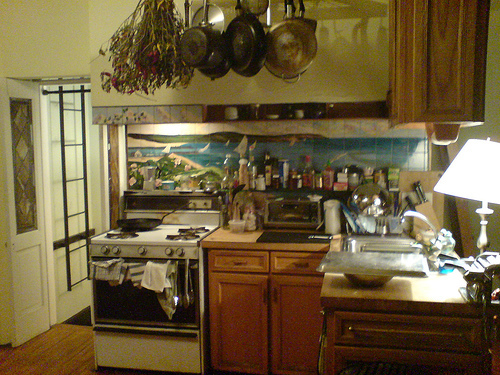 I have at least one little plate of your dishes, and the mural on your kitchen tile is SO familiar---a painting in our den would fit in right there on the left end. 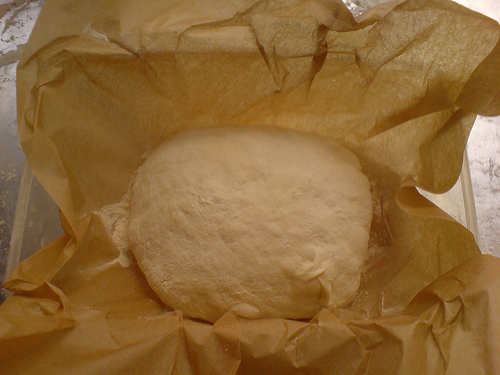 PS What's rising under the sheet pan? Sorry for the delay, had some work issues to deal with early this morning. 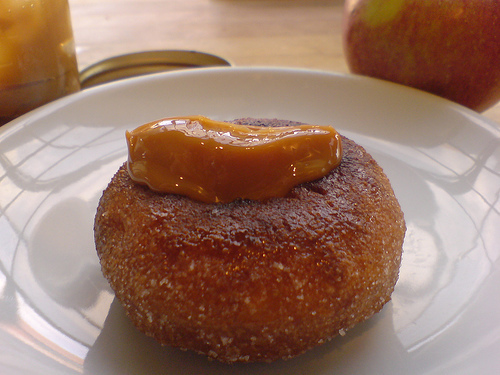 Breakfast this morning is a cider donut from the farmer's market, toasted with a teaspoon of dulce de leche. I made the dulce de leche last week to use it in egg nog this week but it's so good that I've just been putting it on everything. I'll have to make some more tonight. If I had to draw a food pyramid today it would be closer to 30% bread/rice/pasta, 30% meat/cheese, and 40% alcohol. I don't have a favorite cocktail per se but a proper Sazerac always hits the spot. I suppose you could say these days my favorite cocktail is what ever the bartenders at Pegu put in front of me. Sure what do you want? I'll be going through Astor and LeNell's this week to pick up the usual supplies. You'll have to come pick it up in Cambridge though. The Everclear is for making tinctures and bitters. I've been working on a blood orange and szechuan peppercorn bitters. Just waiting for blood oranges to come back in season to make another batch. That picture is from March when I stocked up on the Baby Saz because we didn't know if/when it would be coming back. Now might be a good time to do so again thanks to the NYTimes spilling the beans last week. I use it almost exclusively for making Sazerac cocktails because for everything else I've gotten used to Rittenhouse as my well whiskey. For Manhattans I usually go 2.5 parts whiskey to 1 part vermouth, a dash of bitters, and a flamed orange twist (also a Luxardo cherry garnish if you're so inclined). Since my Manhattan binge last year I don't really make them for myself anymore. When I make them for friends though I tailor it to their tastes so if 4 people asked me for a Manhattan they'd all get a different drink. There are so many variation you can have even with this recipe by blending different whiskeys and vermouths. 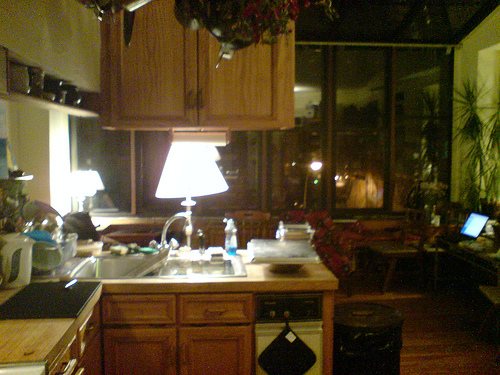 My apartment has a weird layout and was clearly not a single person's design. It seems that different people have added to it over time to what it is now. I'm not sure if that painted mural behind the counter is an out of the box design or some previous resident's art project. I'll take a closer picture of it later tonight but the flowers aren't just painted on, they actually stick out of the wall. 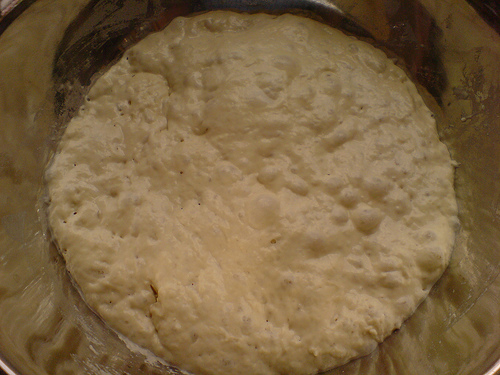 That was the no-knead bread dough under the sheet pan. LeNells still has the Baby Saz. I got some over the weekend. Along with some Overholt. Gotta stock up while you can! An East Coast cocktailian Foodblog. I can't wait to steal shamlessly from any cocktail ideas you present this week. When I'm at work I usually grab lunch near my office in midtown. 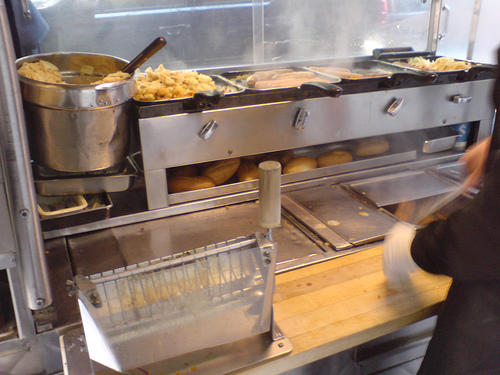 Today I went to the Hallo Berlin "Juicy Food Stand" on 53rd St and 5th Ave. 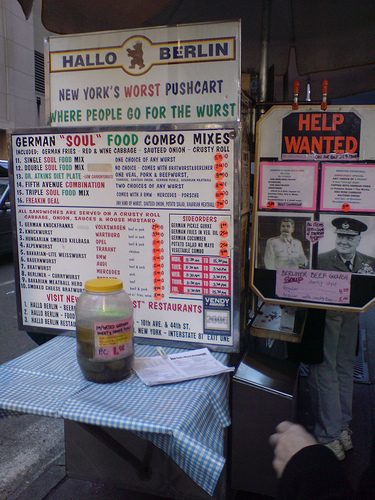 This cart is an offshoot of the Halo Berlin beer garden on (44th St and 10th Ave) and won the Vendy Award last year. They have 9 kinds of sausages and goulash every week day for lunch. Usually a line starts to form before noon and it's a 1/2 hour wait. Thankfully today there was no line at 1pm. 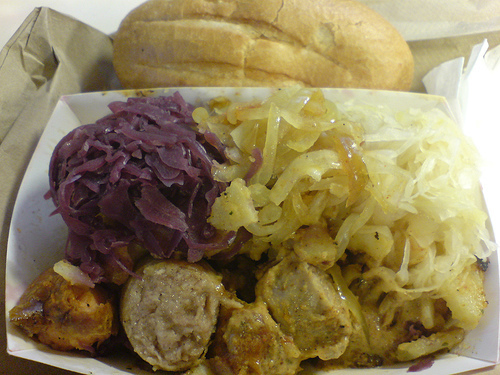 I got the Double Soul Food Mix which is Bratwurst and Berliner Currywurst with red cabbage, sauerkraut, onions, german fries and a roll. Pretty cool; do you know if the vendor cart is at that location on the weekends too? Looking forward to a nice week of cocktails as well! edited to add: I just noticed that you mentioned the cart as being there weekdays for sure at lunchtime but the question stands if anyone knows. Thanks! Not sure and they're not picking up their phone. I try to avoid midtown during the weekends. Given that they're only there for lunch on weekdays I doubt it. I'll walk by tomorrow and ask though. I didn't know that donbert ate anything. I have seen him eat a lot of pork products. Thanks, if you end up having a chance to ask! It would be nice for our Christmas visit to the Met, Rockefeller Center, etc that sometimes falls on the weekend.